Notes: Deal Castle is a 16th-century coastal artillery fort, located in Deal, Kent, England, between Walmer Castle and the now lost Sandown Castle (grid reference TR378521). It is now in the care of English Heritage. Deal Castle is built of Kentish ragstone brick, and Caen stone taken from nearby religious houses after the Dissolution of the Monasteries. 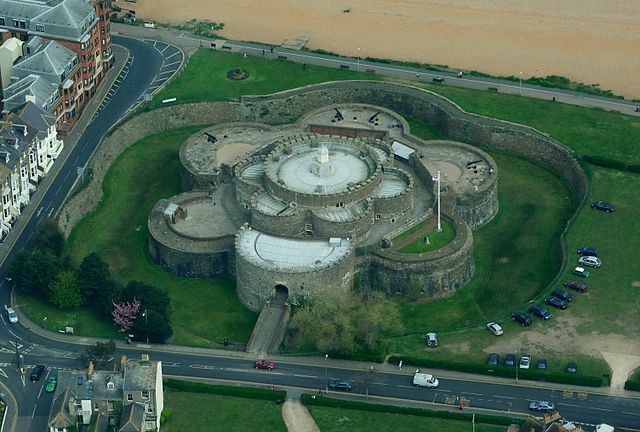 Whether by design or coincidence, the fortress is shaped like a Tudor rose. At the centre is a three-storeyed circular citadel, with six semicircular, slightly lower towers projecting from it. Separated by a narrow ward, a further series of six low semicircular bastions form the curtain wall. The top level of the bastions served as a platform for the heaviest guns. The whole fortress is protected by a stone revetted dry moat, 20m wide and 5m deep. Around the basement level of the bastions, runs a continuous gallery called "the rounds", which is pierced by 53 hand-gun ports or loopholes to allow the defenders to fire into the bottom of the moat. A sally port connects the rounds to the moat floor for counter-attacks. The citadel and outer bastions were originally capped by rounded parapets pierced by embrasures for guns; some of these survive on two bastions on the western side, but most were replaced by ornamental battlements in 1732. The walls originally incorporated up to 145 gun ports on five levels. The westernmost bastion is taller than the others and serves as a gatehouse. Originally, the moat was crossed by a wooden drawbridge; although this has now been replaced by a stone causeway, the slots for the raising gear are still visible. Once inside the gatehouse, any attacker would have to get past a portcullis, five murder holes set in the ceiling of the large entrance passage, an internal gunport in the back wall opposite the doorway and a staggered approach to the ward. The citadel provided accommodation for the peacetime garrison, originally a captain, deputy, porter and 16 gunners, with the officers living on the upper floor. The ground floor served as a kitchen and bakery; the ovens and fireplace survive. In the centre of the vaulted basement is a large well and was also used to store ammunition and supplies.